For other uses, see Blue Division (disambiguation). The Blue Division (Spanish: División Azul, German: Blaue Division), officially designated as División Española de Voluntarios by the Spanish Army and 250. Infanterie-Division in the German Army was a unit of Spanish volunteers and conscripts who served in the German Army on the Eastern Front of the Second World War. It also included over 150 to several hundred men of the Portuguese Legion sent by the Portuguese Estado Novo under the Spanish Flag, many of whom had already fought in the Viriatos during the Spanish Civil War. The Blue Division was the only component of the German Army to be awarded a medal of their own, commissioned by Hitler after the effectiveness it had impeding the advance of the Red Army. Blue Division casualties in all of the Russo-German conflict totaled 22,700 (3,934 battle deaths, 570 disease deaths, 326 missing or captured, 8,466 wounded, 7,800 sick, and 1,600 frostbitten). 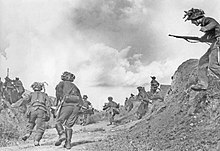 In action against the Blue Division, the Red Army suffered 49,300 casualties. Although Spanish caudillo Francisco Franco did not officially bring Spain into World War II on the side of Nazi Germany, he permitted volunteers to join the German Army (Wehrmacht) on the condition they would only fight against the Soviet Union on the Eastern Front, and not against the Western Allies or any Western European occupied populations. In this manner, he could keep Spain at peace with the Western Allies, while repaying German support during the Spanish Civil War and providing an outlet for the strong anti-Communist sentiments of many Spanish nationalists. Spanish foreign minister Ramón Serrano Súñer suggested raising a volunteer corps, and at the commencement of Operation Barbarossa, Franco sent an official offer of help to Berlin. Hitler approved the use of Spanish volunteers on 24 June 1941. Volunteers flocked to recruiting offices in all the metropolitan areas of Spain. Cadets from the officer training school in Zaragoza volunteered in particularly large numbers and were given leave by the Spanish army. Initially, the Spanish government was prepared to send about 4,000 men, but soon realized that there were more than enough volunteers to fill an entire division: 18,104 men in all, with 2,612 officers and 15,492 soldiers. Fifty percent of officers and NCOs were professional soldiers given leave from the Spanish army, including many veterans of the Spanish Civil War. Many others were members of the Falange (the Spanish Fascist party). Others felt pressure to join because of past ties with the Republic or—like Luis García Berlanga, who later became a well-known cinema director—to save relatives in prison from execution. The division also included a number of Portuguese volunteers. General Agustín Muñoz Grandes was assigned to lead the volunteers. Because the soldiers could not use official Spanish army uniforms, they adopted a symbolic uniform comprising the red berets of the Carlists, the khaki trousers of the Spanish Legion, and the blue shirts of the Falangists—hence the nickname "Blue Division". This uniform was used only while on leave in Spain; in the field, soldiers wore the German Army (Wehrmacht Heer) field grey uniform with a shield on the upper right sleeve bearing the word "España" and the Spanish national colours. On July 13, 1941, the first train left Madrid for Grafenwöhr, Bavaria for a further five weeks of training. There they became the Heer's 250th Infantry Division, and were initially divided into four infantry regiments, as in a standard Spanish division. To aid their integration into the German supply system, they soon adopted the standard Heer model of three regiments. One of the original regiments was dispersed amongst the others, which were then named after three of the Spanish cities that volunteers largely originated from—Madrid, Valencia and Seville. Each regiment had three battalions (of four companies each) and two weapons companies, supported by an artillery regiment of four battalions (of three batteries each). There were enough men left over to create an assault battalion, mainly sub-machine gun armed. Later, due to casualties, this was disbanded. Aviator volunteers formed a Blue Squadron (Escuadrillas Azules) which, using Bf 109s and FW 190s, was credited with 156 Soviet aircraft kills. On 31 July, after taking the standard personal oath to Hitler, under whose authority they were to be fighting, the Blue Division was formally incorporated into the German Wehrmacht as the 250th Division. It was initially assigned to Army Group Center, the spearheading force advancing towards Moscow. The division was transported by train to Suwałki, Poland (August 28), from where it had to continue by foot on a 900 km march. It was scheduled to travel through Grodno (Belarus), Lida (Belarus), Vilnius (Lithuania), Molodechno (Belarus), Minsk (Belarus), Orsha (Belarus) to Smolensk, and from there to the Moscow front. While marching towards the Smolensk front on September 26, the Spanish volunteers were rerouted from Vitebsk and reassigned to Army Group North (the force closing on Leningrad), becoming part of the German 16th Army. The Blue Division was first deployed on the Volkhov River front, with its headquarters in Grigorovo, on the outskirts of Novgorod. It was in charge of a 50 km section of the front north and south of Novgorod, along the banks of the Volkhov River and Lake Ilmen. According to the museum curator in the Spasa Preobrazheniya church on Ilyin Street, the division used the high cupola as a machine-gun nest. As a result, much of the building was seriously damaged, including many of the medieval icons by Theophanes the Greek. In August 1942, it was transferred north to the southeastern flank of the Leningrad siege, just south of the Neva near Pushkin, Kolpino and Krasny Bor in the Izhora River area. After the collapse of the German southern front following the Battle of Stalingrad, more German troops were deployed southwards. By this time, General Emilio Esteban Infantes had taken command. The Blue Division faced a major Soviet attempt to break the siege of Leningrad in February 1943, when the 55th Army of the Soviet forces, reinvigorated after the victory at Stalingrad, attacked the Spanish positions at the Battle of Krasny Bor, near the main Moscow-Leningrad road. Despite very heavy casualties, the Spaniards were able to hold their ground against a Russian force seven times larger and supported by tanks. The assault was contained and the siege of Leningrad was maintained for a further year. The division remained on the Leningrad front where it continued to suffer heavy casualties due to weather and to enemy action. When Franco dispatched more reinforcements, this time it included conscripts as well as volunteers. Through rotation, as many as 45,482 Spanish soldiers served on the Eastern Front. They were awarded both Spanish and German military awards, and were the only division to be awarded a medal of their own, commissioned by Hitler. Eventually, the Allies and conservative Spaniards (including many officials of the Roman Catholic Church) began to press Franco for the withdrawal of troops from the Eastern Front quasi-alliance with Germany. Franco initiated negotiations in the spring of 1943 and gave an order of withdrawal on October 10. Some Spanish soldiers refused to return. While some believed that Franco gave his unofficial blessing as long as their number was below 1,500, on November 3, 1943 the Spanish government ordered all troops to return to Spain. In the end, the total of "non returners" was close to 3,000 men, mostly Falangists. Spaniards also joined other German units, mainly the Waffen-SS, and fresh volunteers slipped across the Spanish border near Lourdes in occupied France. The new pro-German units were collectively called the Legión Azul ("Blue Legion"). Spaniards initially remained part of the 121st Infantry Division, but even this meagre force was ordered to return home in March 1944, and was transported back to Spain on March 21. The rest of the volunteers were absorbed into German units. Platoons of Spaniards served in the 3rd Gebirgs Division and the 357th Infantry Division. One unit was sent to Latvia. Two companies joined the Brandenburger Regiment and German 121st Division in fighting against the Yugoslav Partisans. The 101st Company (Spanische-Freiwilligen Kompanie der SS 101, "Spanish Volunteer Company of the SS Number 101") of 140 men, made up of four rifle platoons and one staff platoon, was attached to 28th SS Volunteer Grenadier Division Wallonien and fought in Pomerania and Brandenburg as Soviet troops advanced into eastern Germany. Later, as part of 11th SS Volunteer Panzergrenadier Division Nordland and under command of Hauptsturmführer der SS Miguel Ezquerra, the Company fought the last days of the war against Soviet troops in the Battle in Berlin. The casualties of the Blue Division and its successors included 4,954 men killed and 8,700 wounded. Another 372 members of the Blue Division, the Blue Legion, or volunteers of the Spanische-Freiwilligen Kompanie der SS 101 were taken prisoner by the victorious Red Army; 286 of these men were kept in captivity until April 2, 1954, when they returned to Spain aboard the ship Semiramis, supplied by the International Red Cross. 138 Iron Crosses First Class. 2,359 Iron Crosses Second Class. 2,216 War Merit Crosses with Swords. To troops, the Spaniards are a crew of ragamuffins. They regard a rifle as an instrument that should not be cleaned under any pretext. Their sentries exist only in principle. They don't take up their posts, or, if they do take them up, they do so in their sleep. When the Russians arrive, the natives have to wake them up. But the Spaniards have never yielded an inch of ground. One can't imagine more fearless fellows. They scarcely take cover. They flout death. I know, in any case, that our men are always glad to have Spaniards as neighbours in their sector. Later when Hitler considered an invasion of Spain to remove Franco and replace him with Agustín Muñoz Grandes, he decided against it, saying "The Spaniards are the only tough Latins. I would have a guerrilla war in my rear." Many of the generals who perpetrated the attempted coup d'état against the Spanish government on February 23, 1981 had served in the Blue Division during World War II. Amongst them were generals Alfonso Armada and Jaime Milans del Bosch. Other Blue Division veterans, including Director of the Guardia Civil José Luis Aramburu Topete and José Gabeiras, remained loyal to the legal democratic government under the young King Juan Carlos I of Spain. During the German occupation of Velikiy Novgorod, the city's kremlin suffered heavy battle damage. However, the Orthodox Cathedral of Saint Sophia itself survived. The large cross on the main dome (which has a metal bird attached to it, perhaps symbolic of the Holy Spirit in the form of a dove) had fallen during shelling of the city while it housed the headquarters of the División Azul during World War II. The cross was carried back to Spain, first to Burgos and afterwards to the Spanish Army Engineers Academy in Hoyo de Manzanares near Madrid. [better source needed] It remained in the Madrid Military Engineering Academy Museum until 16 November 2004, when it was handed back to the Russian Orthodox Church by its discoverers, the Spanish historians Miguel-Ángel and Fernando Garrido Polonio. ^ a b c Clodfelter, Micheal (2017). Warfare and Armed Conflicts: A Statistical Encyclopedia of Casualty and Other Figures, 1492-2015, 4th ed. McFarland. p. 456. ISBN 978-0786474707. ^ Carlos Caballero Jurado; Ramiro Bujeiro (2009). Blue Division Soldier 1941-45: Spanish Volunteer on the Eastern Front. Osprey Publishing. p. 34. ISBN 978-1-84603-412-1. ^ "Divisão Azul - Portugueses que combateram ao lado de Hitler". Retrieved 2 March 2019. ^ Silva, Ricardo Daniel Carvalho da (2012). "Portugueses na Wehrmacht. Os Voluntários da Divisão Azul (1941-1944)" (Faculdade de Ciências Sociais e Humanas, Universidade Nova de Lisboa). Retrieved 2 March 2019. ^ Stanley G. Payne; Delia Contreras (1996). España y la Segunda Guerra Mundial. EDITORIAL COMPLUTENSE S.A. p. 85. ISBN 978-84-89365-89-6. ^ Wendel, Marcus. "Tactical Headquarters Bjelovar (Croatia)". ^ Candil, Anthony J. "Post: Division Azul Histories and Memoirs". WAIS - World Association for International Studies. Retrieved 3 June 2014. ^ a b "28. Jäger-Division". ^ "History journal of the History Society, new series". History Journal of the History Society (2–4). 1976. Retrieved 8 June 2014. ^ "Bono devuelve a Rusia la cruz que se llevó la División Azul- Foro por la Memoria". Gustavo Morales & Luis Togores, "La División Azul: las fotografías de una historia". La Esfera de los Libros, Madrid, 2009, second edition. Wikimedia Commons has media related to Blue Division. This page was last edited on 8 April 2019, at 17:42 (UTC).